Show your Hoosier pride in these officially licensed replica jerseys! There is no better way to show your Hoosier Pride than with an Indiana University jersey. Generations of Indiana University Alumni and Fans know that an IU jersey is year-round attire. Whether visiting the campus as a prospective student or visiting children, grandchildren or siblings who currently attend, sporting your Cream and Crimson shows everybody that you are where you belong. Of course, now your connection to the Indiana University Hoosiers may be less a matter of geography or academic connection and more a matter of love for Your Team no matter where you live. If that’s the case, the proud tradition of Indiana State Hoosier apparel is the right fit for you as well. Of course, there’s no better place for an Indiana Hoosiers jersey than at an Indiana University sporting event. Whether you’re rooting on the home team, or traveling to support IU at an away game, you’ve got a place in the bleachers to stand – or sit – proud in your Indiana Hoosiers gear. When you’re in the stadium cheering for the football team, off the court roaring for the basketball team, or out supporting any of the other great athletic teams that Indiana University fields each year, you want to be loud and proud and sporting the right apparel. Hoosier Team Store carries a wide selection of Indiana Basketball jerseys, the most popular and comfortable way to showcase your Indiana University pride. Offering IU basketball jerseys in a variety of colors, styles, and sizes to help you find the IU basketball jersey that’s perfect for you. 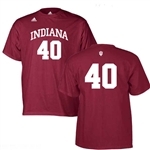 Find the number of the Indiana Basketball jersey that fits your Team Spirit best, including #40 for fan favorite Cody Zeller. Shop for yourself and all the fans among your family and friends, with the right fit for any member of your pack, including if you need an Indiana infant basketball jersey. Once you’re all suited up in your own personal Indiana University basketball jersey, you’re all set to watch the game at home, to travel to the game, or to celebrate events in the lives of your current IU attendees and alumni. 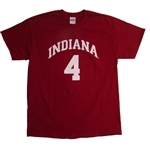 Show up in your Indiana Hoosiers basketball jersey from HoosierTeamStore.com and they’ll know you have real Hoosiers pride!